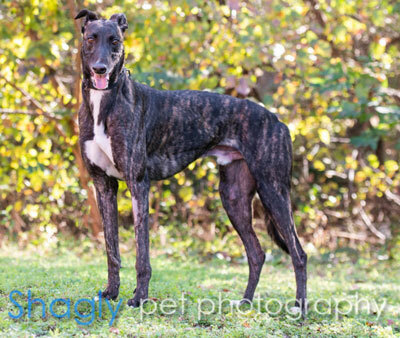 Seth, aka Setum Up Cowboy, is a 2 year old dark brindle male born July 25, 2016. His sire is Craigie Whistler and his dam is Bob's Deb, making him half-sibling to Laura. Seth has 37 races on record in 2018 in Texas and Florida. 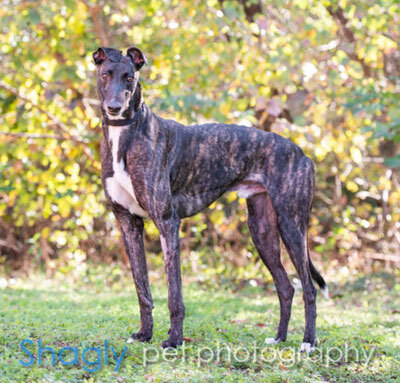 He retired due to a tendon sprain and is looking forward to finding his forever home. Seth is not cat safe. Seth is such a love! He loves getting pets, ear scritched and generally loved on. He will just lean in on you and let you pet him as long as you like. He loves playing with stuffies and he shares them politely. He enjoys a morning romp around the back yard. He is crated at bed time and when we are away from the house, and he does not have any issues with that. He has excellent house manners and is good about asking to go out when needed. He is a bit of a breed snob. He does great with other greys but he seems to see other breeds as big stuffies ready for him to play with and nibble on. He does not exhibit those behaviors with other greys. We do not feel that Seth should live in an apartment complex where there are cats or small dogs around. If you have a backyard and lots of toys, you could be Sweet Seth’s special someone!